EXPANDED BPA GAME LIBRARY: BPA thanks the publishers listed below for their 2010 support of the BPA Game Library, which will join new tables, storage, AV facilities, meal service, and a photo gallery to augment the 13,000 sq ft tiered dinner theatre of the Lancaster Showroom as the new Open Gaming focal point of WBC in 2010. The 2010 Library donors include Rio Game Games, Stratamax, Queen Games, Out of the Box, Valley Games, Lock 'N' Load, Z-Man Games, Clash of Arms, Worthington Games, Stronghold Games, Columbia Games and Days of Wonder. WBC EVENTS PAST & PRESENT: David Dockter has compiled some interesting statistics on WBC events rendered in graph form. For those hankering a trip down memory lane, Kaarin has recently compiled a list of all the events ever run at WBC and Avaloncon with links to the results (where they exist). WBC 2010 is also now on line with a "host" of new features and attractions. In-depth previews of each of the 2010 WBC tournaments, including a record nine Pre-Cons—many with new formats—are now on line as only WBC does them. The 2010 program containing the complete alphabetical and chronological schedule is now posted on line. 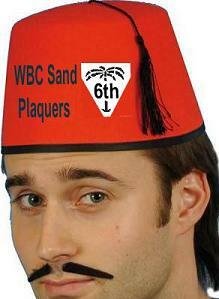 Other scheduling aids are also provided to help you plan your WBC week. Choose from among the Custom Scheduler, an All-in-One schedule, or several downloadable pdf pocket schedules in color or black and white. In keeping with the family-friendly atmosphere of Lancaster Host, which is adjacent to Dutch Wonderland amusement park, WBC again offers a full schedule of Junior events. TEAM TOURNAMENT: What do we do for an encore after the 104-team field of 2009? Will the record fall again? Will Nest of Spies be the prohibitive favorite again? The Happy Handicapper is sharpening his pencil and calculating the odds for the first six teams to enter: Reese's Pieces, Gang Greene, 3rd Gen Gamers, Polish Lancers, KoleszarLienzPlat, and Band of Fools. Where is your entry? AUCTION DEADLINE NEARS: With only six weeks left, there is still plenty of room in both the auction and auction store. As of June 15th, there are 141 items registered for the auction store and 266 items submitted for the auction. Check out the auction page on the website for details on how to register your items for both the auction and the auction store. Items must be delivered in person on Monday night, Aug. 2 or the following Tuesday morning before noon by registered members. Our previous auctions have sold out via pre-registration so don't expect to bring items unregistered to the door. Check out the details at http://www.boardgamers.org/wbc/auction.htm. Download your Lot Forms now. Don't procrastinate! NEW this year: upon receipt of your submission, you will receive confirmation that your list was received. However, decisions on acceptance of lots will not be sent until July 1. All submissions should be sent to wbcauction@boardgamers.org. AUCTION STORE PRE-REGISTRATION REQUIRED FOR MONDAY DELIVERY: NEW: Pre-registered Items with lot slips are to be delivered between 6 and 10 PM Monday. Auction Store items will NOT be accepted on Tuesday, Aug. 3. Located in the same showroom with the Auction, buyers will be able to peruse items with a set price within view and earshot of the auction. The Auction Store allows us to increase the number of items handled in less time while offering sellers a more efficient way to offer lower priced items at a reduced commission. Items in the Auction Store have a top price of $30 AND MUST be pre-registered by July 26th. Don't be turned away for failure to pre-register items as a few scofflaws were last year. Unregistered items will not be accepted. You need not prepay any fees until you deliver your items to the Auction Store but the items MUST BE preregistered. Come prepared with your Auction Store Item forms pre-completed. After processing the submission, the Auction Store Administrator will provide Lot Numbers for the items. See http://www.boardgamers.org/wbc/auctionstore.htm for details and to download your Auction Store forms. WBC 2010 PRE-REGISTRATION FORMS: The current Pre-Reg form can be downloaded from http://www.boardgamers.org/downloads/WBC10prereg.pdf and should be of interest even to current members for its information on the popular WBC game duffel bags and souvenir t-shirts. You can also check http://www.boardgamers.org/wbc/prereg.htm for your current registration status or to advertise for rides, roommates, or Open Gaming opportunities. If you'd like help with any of the above, just email your requests to acd@boardgamers.org to be listed on the page. All we ask is that you notify us to remove your listing once your need is fulfilled. A limited number of 2009/2010 Yearbooks will be available for $10 each while supplies last. See the pre-registration form for ordering information. Late joining Tribune members may also pick up a free copy at registration while supplies last. WBC SOUVENIR T-SHIRTS & DUFFLE BAGS: WBC again features the original high quality, silk-screened shirts featuring the BPA logo. We will not be making shirts on site so if you'd like a souvenir shirt, you need to pre-order it for pickup at the show. See the pre-registration form for details. This year's color is sand. Likewise, the supply of duffle bags is limited and will be sold on a first come, first served basis. Retiring BPA Board Members Bruno Passacantando and Keith Levy. 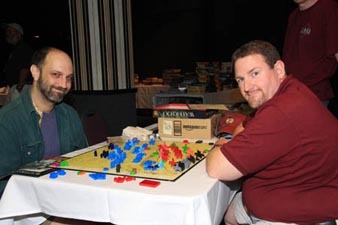 BPA member Jay Fox was the Ticket to Ride North American Runner-up and competed in the Ticket to Ride World Championship on June 19 in Paris, France. WBC 2010 POSTER/FLYER: Help spread the word. Download the current WBC poster or flyer featuring the artwork of Kurt Miller and post it at your next club meeting or ask your local gamestore to display it. CHARLES ROBERTS AWARDS: The annual Game Design Awards announced and presented at WBC every year are now conducting their online voting through Sunday, July 18. You are encouraged to support your favorites. REVAMPED SAMPLER SHOWCASE: Thanks to the globe trotting efforts of Tom McCorry, the Sampler Showcase is back as an introduction (not a pre-con) of the new full week of WBC. Sampler Showcase is an Open Gaming festival free to all paid WBC attendees featuring scheduled hands-on sessions for learning new games under the direction of volunteer game mentors who will be on hand to teach 12 exciting new games. See the schedule on the WBC website. TICKET TO RIDE WORLD CHAMPION: Patrick Deckers, the Benelux Champion, won the 1st TTR World Championship on June 19 in Paris, France, to win a fabulous journey on the Orient Express. Jay Fox, the current WBC runner-up, also maintained second best status by being the North American runner-up and won a trip to Paris and one of the eight seats at the Championship. Eric Miller, another WBC alumni, won the North American title to lead the American contingent. COUNTER CULTURES: THE SECRET LIVES OF GAMES is a major exhibition of boardgames appearing at the San Diego Museum of Man, 1350 El Prado, San Diego, CA 92101 from June through April 15, 2011. It displays 170 traditional and proprietary table games from all places and times for the larger purpose of discovering their role in human societies. See the museum's website for more information. VICTORY IN THE PACIFIC: The field of 28 has been whittled to four as the semi-finals get underway. The top seeds have never been perfect since the first round, but they continue to do well with 4th seed, Michael Ussery, winning in four turns as the IJN over Robert Drozd; and 5th seed, Jim Eliason, saw his USN best Bryan Eshleman also in four turns. The top seed, Nick Markevich, had a very short bye. The lone bottom seed to prevail, number seven Michael Day, defeated Ed Paule, 3rd seed, by 5.5 after eight turns of action (which, nonetheless, was played so quickly that it finished before either of the other two games with half the number of turns). It was a good round to be named Michael! Jim's game was memorable in that the USN lost fewer ships during the entire war than the actual United States lost at Pearl Harbor. The dice were not kind to Bryan. Nick faces Jim while the two Michael's play each other in the semi-finals... Fast and furious action can already be seen at http://www.gameaholics.com/vitp_bpa/vitp_bpa_single_elim_09.htm. ADEL VERPFLICHTET: The semi-finals have ended. The top ten have become the elite five. Steve Cameron won both of his semi-finals by three spaces. Raphael Lahrer and Bob Hamel each won a semi-final to advance as well. The final two spots in the Final went to the best second place finishes: Tom DeMarco (who finished second in both semi-finals and was five spaces over the line in his best finish) and Greg Thatcher (with a second and a third place finish). Greg squeaked in over the other second place finisher, Marc Houde (who also finished four spaces over the line), by virtue of his nine-card set (vs. Marc's six). Marc finishes the tournament in sixth place. The early Final action has Bob Hamel sprinting to a quick lead while Tom and Greg, near the back, have built impressive collections. Watch the action at http://www.gameaholics.com/adv_tournament.htm! Last updated 6/28/10 by kae.